Peter Mayle’s books about his life in the Luberon – a region in Provence – made the region famous amongst Anglophones. His lively anecdotes caused many a day-dreaming armchair traveller not only to visit the Luberon – but in fact it inspired many to uproot their lives and move into their own beautiful French villa in the picturesque Luberon. Peter Mayle was not the first person to discover the Luberon, however. 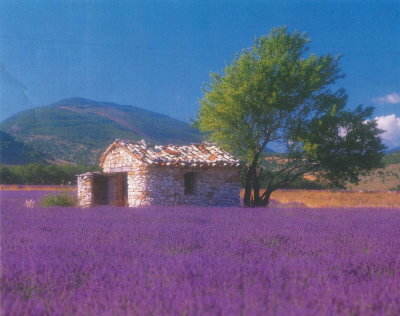 Long before the 1990’s, Provence intoxicated people with its natural beauty. In the 19th and 20th centuries, famous painters and writers flocked to the area in search of inspiration. The painters in particular were drawn by the special quality of the light. The light in Provence has an exceptional clarity, caused mostly by the famous ‘Mistral’ wind, which removes dust from the atmosphere and increases visibility. Van Gogh, Cezanne, Matisse, Renoir, Picasso, Monet and many others travelled to the area, fascinated by the effects of the light and the beauty of the landscape. This region of Southern France also enjoyed a particular vogue during the 20’s and 30’s with English writers. And yet despite the ever-increasing interest in the Luberon, it has largely managed to remain the idyllic, wild and charming place which caused all this fuss in the first place. You will still see old men playing Petanque (Boules) on a lazy sunny afternoon, you will still find small isolated villages clinging precariously to wild rocky mountainside, and you will still feel the intoxicating energy which has inspired so many artists – whether you are artistically inclined or not. The Luberon is arguably the true heart of Provence: a land of rugged limestone cliffs, wind-swept mountains, old stone huts and ruins, crumbling farmhouses, and beautifully-restored homes. And above all, sweeping views of the stunning landscapes. We would recommend that you make a top-quality vacation villa your home-base in the Luberon, and make day-trips to explore other areas in South France. That is, if you can pull yourself away. One of our favourite spots is a little town called Gordes – officially one of the most beautiful towns in France. What makes it so special? The approach to the town is spectacular – white stone buildings grasping hold against the side of the sharp cliff of a mountain. Find yourself wandering its charming streets which form a labyrinth of winding cobblestone, perusing the weekly market, or throwing yourself into its vibrant art scene. Hiking is very popular in the Luberon. It not only offers stunning landscapes, but there is also a surprising variety amongst these landscapes. There’s little chance of becoming weary from repetitive views in this region of France. Not only is there scenic variety, but there are also trails which vary in their level of difficulty and length — so regardless of your experience, there will be something to suit you. For more information in hiking in the Luberon, this page from Slow Travel France is very informative and useful. The Markets in the villages of the Luberon are a festive affair not to be missed. Some of the busier markets verge upon a carnival-like atmosphere, with many different things to see, sample and buy. The centre-piece of these markets is the fabulous fresh food. Pick up some fresh cheese, vegetables and fruit and head off into the countryside for a picnic. What could be better than that? You will also find clothing, jewellery, crafts, and many other things. We have many beautiful villas in the Luberon to suit various holidays. Below is a selection of high quality villas from the Luberon region. Please don’t hesitate to contact us – we would be more than happy to assist you.